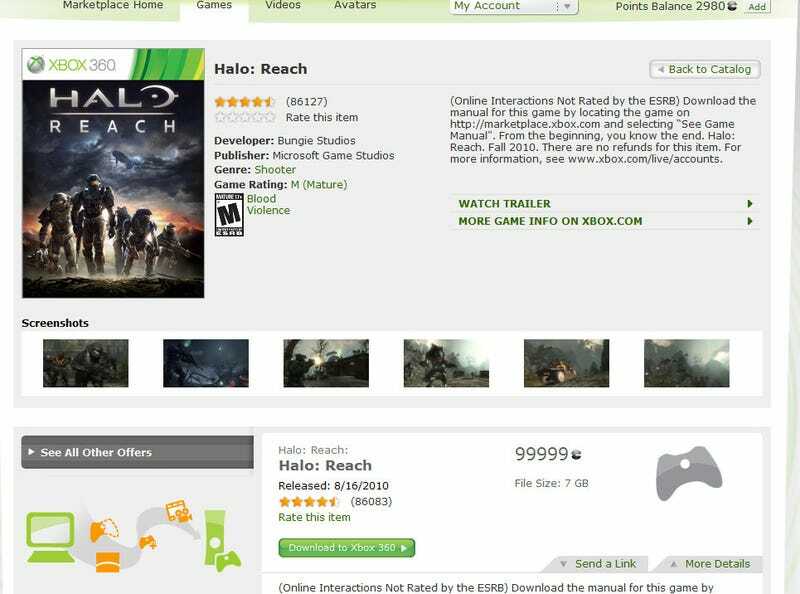 Why does Microsoft seem to be selling Halo Reach over Xbox Live right now for $1250? Answer from Microsoft: They're not, and they don't plan to sell Reach as a downloadable game. "We plan to provide a limited number of copies of 'Halo: Reach' using the Games on Demand technology for media review purposes only. While we are thrilled to be able to take advantage of the technology to provide media with a more accessible and convenient review experience, there are no plans to launch 'Halo: Reach' to the public through [Xbox Live download service] Games on Demand." Microsoft used this technique with Crackdown 2, providing reporters like me codes for the full retail game that were redeemable over Xbox Live prior to the game's release. Crackdown 2 is not sold to regular Xbox 360 consumers through the Games on Demand Xbox Live shop. It is only sold on disc. If you want to buy Halo Reach for your Xbox 360, you'll have to get it on disc next month. The game launches on September 14.